Three-way flush system for a cleaner toilet. 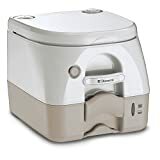 Comes with a storage bag to keep the unit clean and dust-free when not in use. Excellent price and value for money. No rotating spout for easier and cleaner waste removal. No waste tank level indicators. The Serenelife SLCAT120 is a proven performer and is the second most popular with our readers. 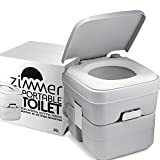 This portable toilet does everything it can to match itself with the more well-known brands. Whilst it lacks some of the better options like rotating waste spout and level indicators, it has the new three-way flush technology. For the price, it's good value. Made of strong and durable polyethylene. Perfect for outdoor adventures. A large 3.2 gallon freshwater tank. Design supports easy cleaning and maintenance. The waste tank is separated from the bowl by a double sealed sliding valve, preventing splashback and spills. Molded handles on both tanks make transporting easy. Easy to fill water tank as it has a good sized opening. The openings on the waste tank are also large and have a strong cap. Tank capacity: Waste tank is 5.3 gallons and fresh water tank 3.2 gallons. Another excellent portable toilet with strong foundations and a good price. Excellent height at 16.9″ high. 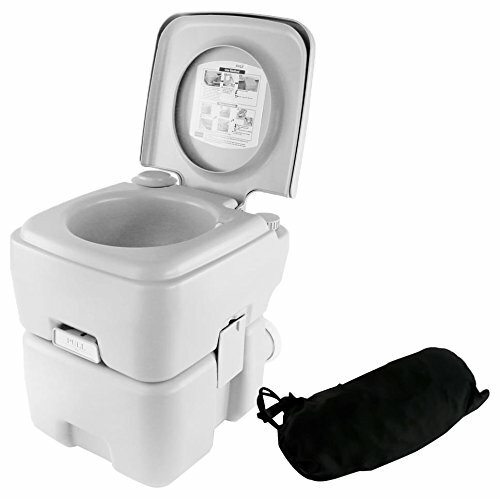 The three-way flush system means that the bowl is kept much cleaner, with the water covering more of the bowl on each flush. Compact and easy to clean. There is no rotating spout on the waste tank. There are no waste tank level indicators. A visual inspection is required by looking into the bowl with the valve open to check the levels. Alternatively, you can pick up the unit, or separate and pick up the waste tank to check the weight. Regular use will give you an understanding of when to empty. A pull out lever operates the sliding valve that covers the hole at the bottom of the bowl. When the toilet is not in use, and when being emptied, the valve should be closed. Before using the toilet, the valve is opened. The toilet seat and seat cover does not lock down. Both the top and bottom parts of the toilet may be separated. The upper unit contains the freshwater whilst the bottom holds the waste. 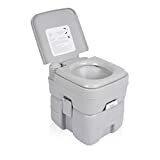 The upper and lower units can be simply separated by the side latches, meaning it is easy to transport either tank to dumping or refilling areas. Help to keep the toilet clean by putting some water or a small bit of toilet paper in the bottom before using it for solid waste. Keep the lid of the toilet closed until you have moved the lever to open the access to the waste tank before use. Keep some wet wipes close by to encourage others to clean the toilet after use if necessary. Don’t flush these down the toilet. 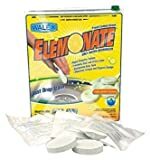 Using the appropriate cleaning chemicals not only helps to keep the camping toilet clean but also assists with keeping the parts lubricated correctly. It’s a good idea when handling portable toilet waste tanks to have some disposable gloves with you. Cleaning the water tank will require a hose be placed into the opening to get a good clean. As the waste tank does not have an additional rotating spout, you will need to take care not to splash yourself when cleaning. 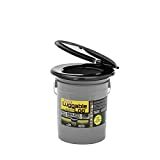 As the warranty does not cover damage you might do to the portable toilet, it is recommended to use recommended portable toilet cleaning products. Never use rough cleaners, pastes, scourers or acids on any of the toilet or toilet parts, especially the valves and seals. Using the recommended products also helps to keep all parts properly maintained. The information contained in this website is for general information purposes only. The information is provided by Best Camping Toilets and while we endeavour to keep the information up to date and correct, we make no representations or warranties of any kind, express or implied, about the completeness, accuracy, reliability, suitability or availability with respect to the website or the information, products, services, or related graphics contained on the website for any purpose. Any reliance you place on such information is therefore strictly at your own risk. 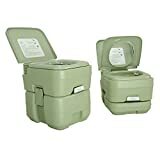 BestCampingToilets.com is a participant in the Amazon Services LLC Associates Program, an affiliate advertising program designed to provide a means for sites to earn advertising fees by advertising and linking to amazon.com, amazon.co.uk, amazon.ca, amazon.de, amazon.fr, amazon.it amazon.br and amazon.es. Amazon and the Amazon logo are trademarks of Amazon.com, Inc. or its affiliates.